Player vs. player combat required. Upon reaching Honor Level 400, Horde characters are rewarded with this companion pet. Players that have unlocked this PVP reward can use a max level Alliance character to purchase the opposing faction's equivalent crab pet (Sir Snips). I'm just hoping that once you get to 400 with one faction you can just buy the other faction's 400 honor level pet like you could in legion.. I hope this won't be too overwhelming to farm. I have 48 honor right now. 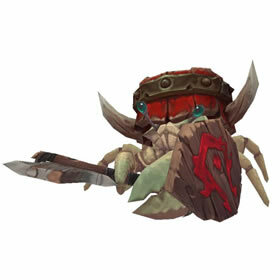 No one knows who first started dressing up crabs in Azeroth, and it won't be stopping any time soon.